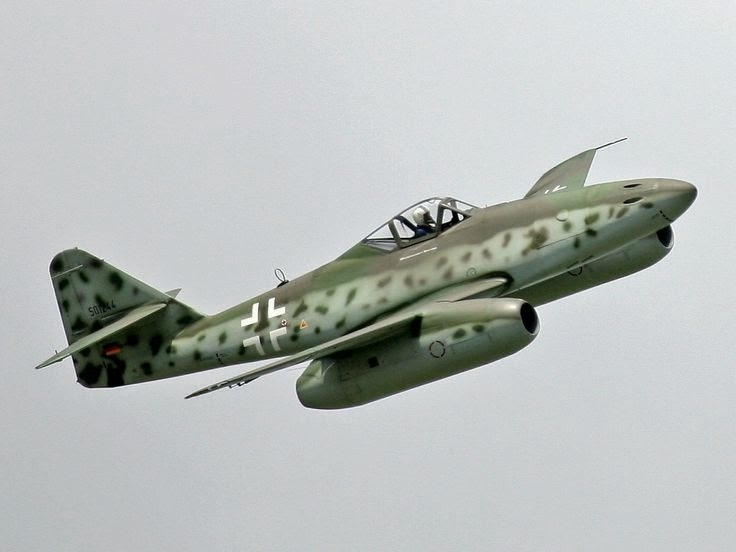 The Messerschmitt Me 262 Schwalbe (English: "Swallow") was the first operational jet fighter plane. 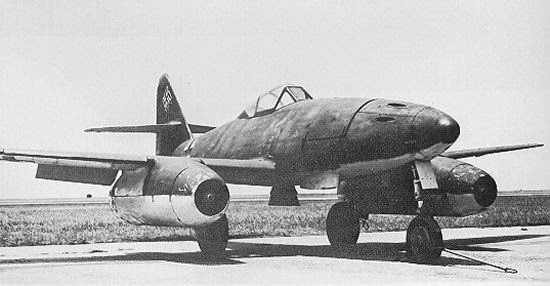 Although it only appeared in the closing months of the war, the ME 262 was far from a last-ditch move of desperation or panacea fantasy project, of which there are many other examples. Instead, it was a carefully developed and extremely capable machine which actually did what it purported to be able to do, and did it very well. The Allies also had jet aircraft either in development or in provisional use behind the front lines during the closing months of World War II. 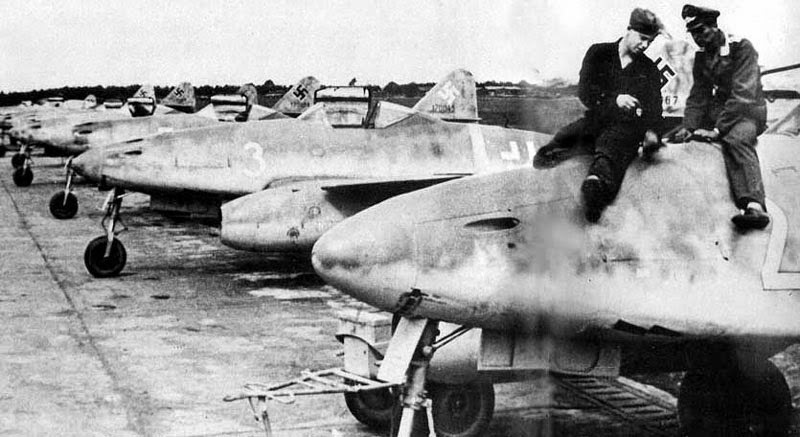 None saw combat, and none matched the capabilities of the ME 262. Its pilots claimed 542 kills, which did not affect the strategic situation but did badly scare Allied planners and also likely saved the lives of some German civilians. They are lined up and ready to roll in quick order. Any Allied bombers in the vicinity are in for a treat! The Germans built their first jet engine in 1936, designed by Hans Joachim Pabst von Ohain. A test plane, the Heinkel He 178, flew in 1938. 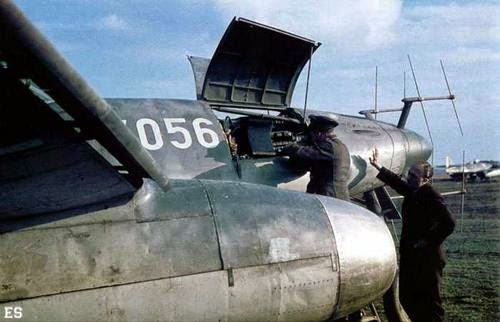 Development on a fighter version began at once, led by by Messerschmidt designers Dr. Woldemar Voigt and Robert Lusser. 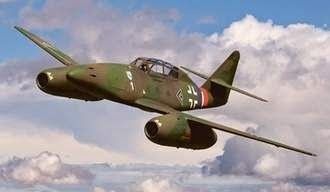 Me-262 nachtjager - with radar for night interceptions. This one shows signs of heavy use. It took time to develop the fighter, and the hold-up was the engines. The entire design had to revolve around the fragile new engines. Also, the Germans were overconfident and did not think they would need the plane quickly, as the war was going well. The design team was slashed in February 1940. Other aircraft were easier to make and needed immediately. 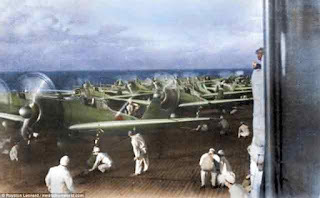 Nevertheless, progress continued, and the first successful jet-powered flight was on July 18, 1942. 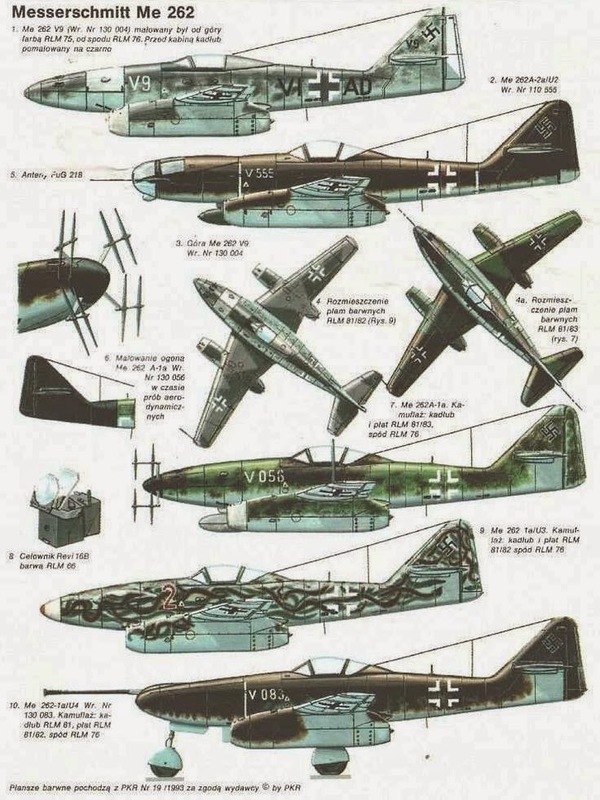 The major permutations of the Me 262. "Jabo" is short for "Jagdbomber" and means "ground attack plane" or "fighter-bomber." Almost all Luftwaffe combat planes were expected to have some dive-bomber capability. In the case of Jabos, they would release their bombs and then effectively become fighters. 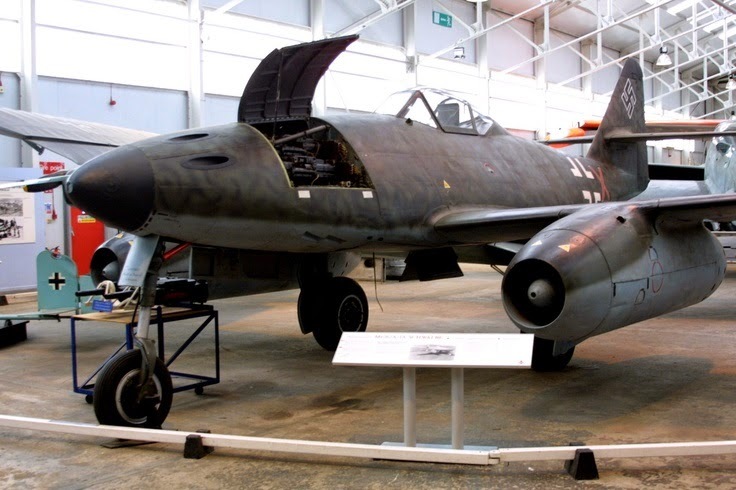 That this was a somewhat ridiculous capability for the Me 262 is fairly obvious, but Hitler wanted it, envisioning the Me 262 as being part of an effort to rain death and destruction on an attempted Allied landing in Northwestern Europe. In the event, the Jabo version was basically a non-starter and saw virtually no action - but it did cost ReichsLuftfahrtMinisterium boss Erhard Milch his job when Hitler found out that his fighter-bomber version order basically was being ignored. Another hold-up was interference by Adolf Hitler, who wanted a ground-attack bomber rather than another fighter. 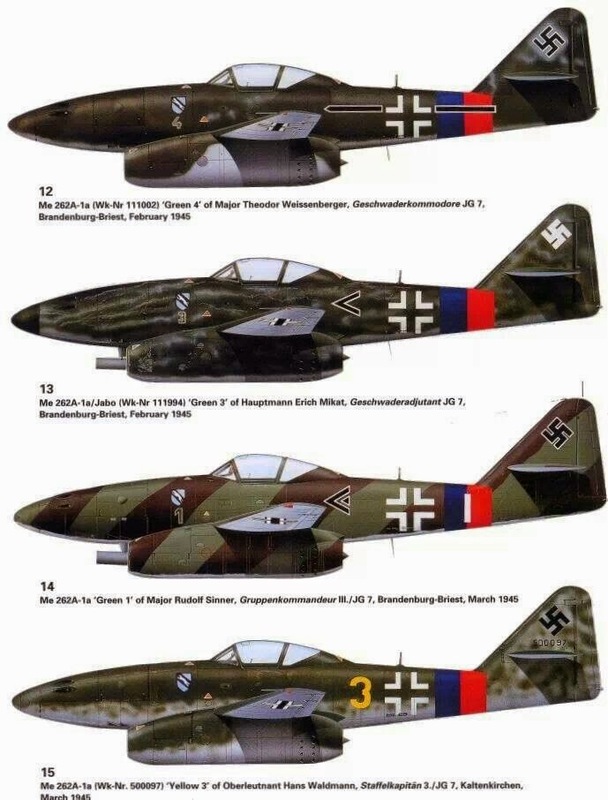 However, this only resulted in a variant being designed, the Sturmvogel, and development on the main fighter version continued regardless of the wishes of higher-ups. The engines were the problem that had to be overcome, not Hitler. Those who claim that he personally kept the aircraft from appearing in the skies are misguided. A fleet of ME-262s ready to go, parked under the open sky - no worries in the world. 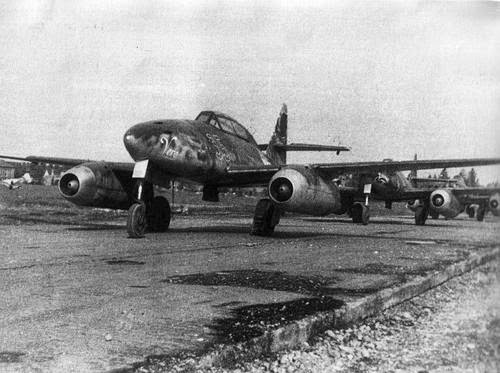 The initial ME 262s were organized into Erprobungskommando 262 at Lechfeld near Augsburg in the spring of 1944, based at Achmer and Hesepe. The first combat success was on July 26, 1944, when a ME 262 damaged (and may ultimately have caused the destruction of) a Mosquito bomber. This was significant, as the fast and nimble Mosquito was considered a difficult aircraft to destroy. Around this time, the unit became operational as an Einsatzkommando known as Kommando Nowotny after its commander, Major Walter Nowotny. The Allies noticed the new fighters appearing in the skies over Germany that August, and this unexpected development began to worry USAAF General Carl Spaatz and the intelligence boys. Sporadic ME 262 missions continued through the fall. Nowotny himself was shot down on November 8, 1944. The unit was reorganized into a fighter squadron (Jagdgeschwader), JG 7, commanded by Macky Steinhoff, but it was withdrawn until January 1945. Lieutenant General Adolf Galland took over a unit in February 1945 and created a "superstar of the Luftwaffe" unit, staffed by the best pilots. This unit hit the Allies hard in March 1945, operating in numbers for the first time and scoring kills. One Luftwaffe pilot, Hauptmann Franz Schall, was credited with 17 kills, and another, Oberleutnant Kurt Welter, claimed 25 kills. Oberstleutnant Heinrich Bär claimed 16 kills. Things got crazy toward the end. Here, after it was all over, we find the top fighter of its time had been converted in the final days into a tankbuster. As always with any good plane, weak pilots were still shot down, while the best racked up the kills. That any pilots could creditably claim that many kills in the short time that the ME 262 squadron flew is remarkable and illustrates the power of the design. Armament varied. Some versions had four 30 mm MK 108 cannons, others only two. Some were armed with rockets, 24 x 55 mm R4M rockets. 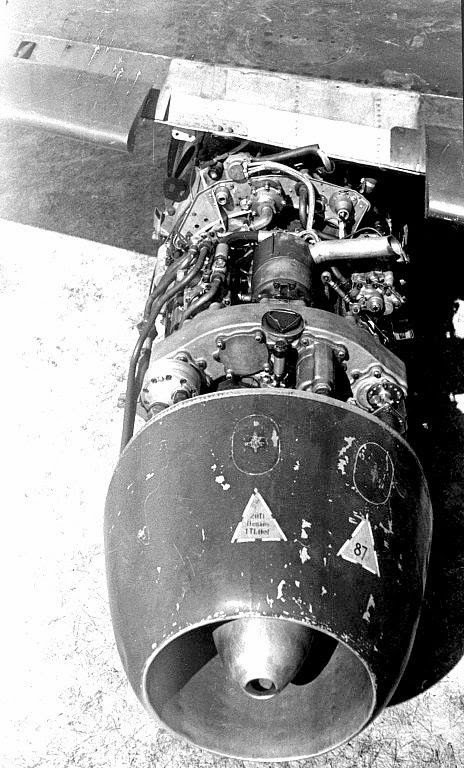 The ground attack versions, which were not successful, carried 2 x 250 kg boms or 2 x 500 kg bombs. 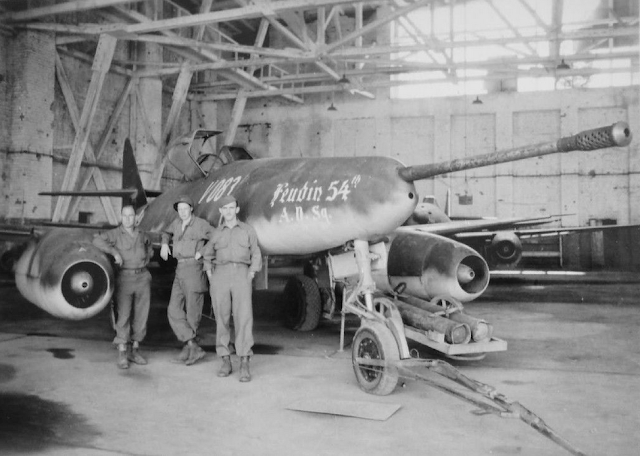 The ME 262 was superior for its time, but it was far from perfect. It had a relatively short combat range, and the engines were vulnerable to enemy fire. The engines themselves burned out quickly and only lasted a certain number of hours before having to be replaced. "Was there any German aircraft that you evaluated during the war where you thought, 'this is so much more advanced we should just put it into production ourselves in the UK'?" "Oh Yes. The one which was... which staggered us, frankly, with its quantum jump in performance was the jet - twin jet - Messerschmidt 262. When I tested it here at Farnborough, it was 125 miles an hour faster than any Allied fighter. Now, this puts it in a league by itself, and it was virtually untouchable. And that rattled us, frankly, to find that, and it's just as well that they were unable to produce them fast enough to really make a nuisance of themselves. Anyway, at this stage in the war, which is very late, the Germans were running out of pilots and running out of fuel, but the thought of them perhaps having pilots and fuel and a lot of these jets was a bit sobering." 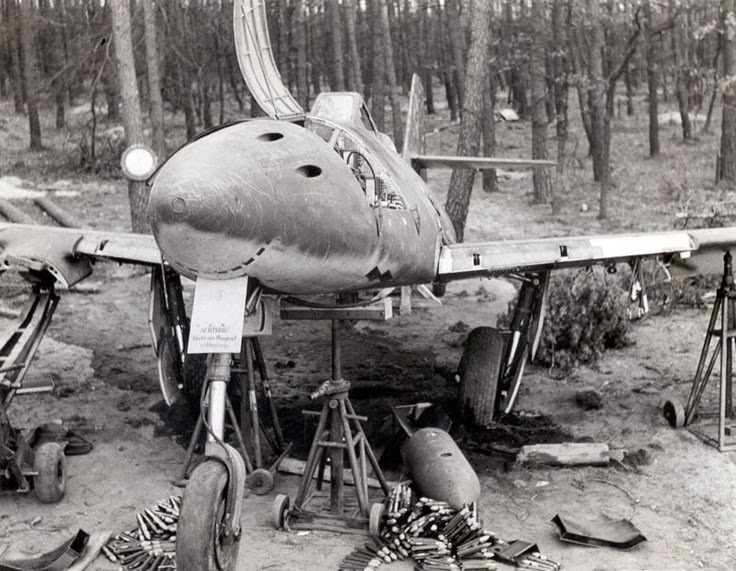 Several ME 262 survive, in museums and in private hands. Some replicas are in flying condition. The ones being built today are considered part of the original production run begun during World War II. Below is Wink Brown's interview in 2010.